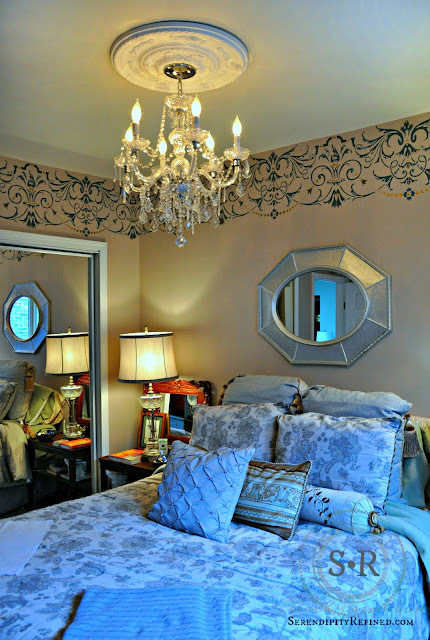 Over the weekend, I had the pleasure of creating a large, multi-toned stencil for the bedroom of my friend, Sadie. Sadie is English by birth, a floral designer by trade and a fellow lover of all things vintage. Her bedroom is an eclectic mix of things that she loves and which tell the story of her life so, when she asked me to stencil it for her, I knew that the stencil that she had chosen would be gorgeous....even before I saw it. The stencil that Sadie purchased was huge! About 18 inches from top to bottom and approximately 30 inches wide to the repeat. 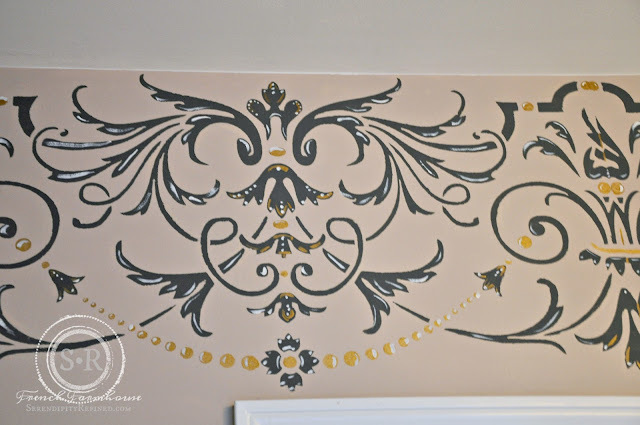 I had never worked with such a large stencil but after figuring out a couple of tricks to make it easier to work with, I loved the fact that it only took four placements to cover an entire wall. I found that when working with a large stencil, using repositionable spray adhesive to adhere the stencil to the wall makes it much easier to handle and position the stencil. For the main portion of the stencil, we chose a cool dark gray. First, using craft paint and a flat stencil brush, I stenciled the gray which makes up the main portion of the design. 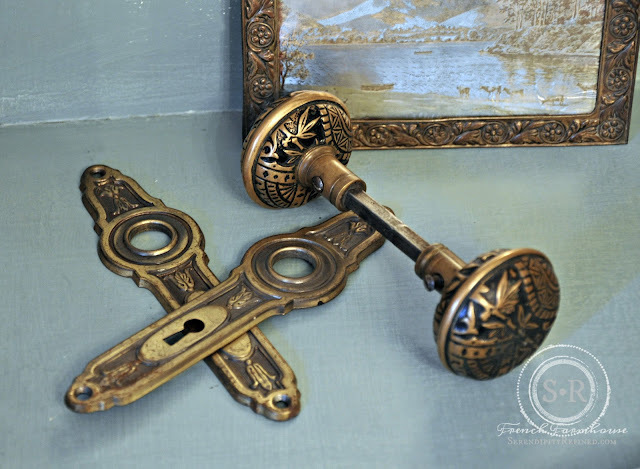 Then, I stenciled some parts of the pattern with gold metallic craft paint.and a smaller flat, round brush. After allowing the paint to dry for a minute or two, I carefully removed the stencil by peeling toward the center from both edges. Finally, I hand painted gold and white highlights to give the pattern dimension. 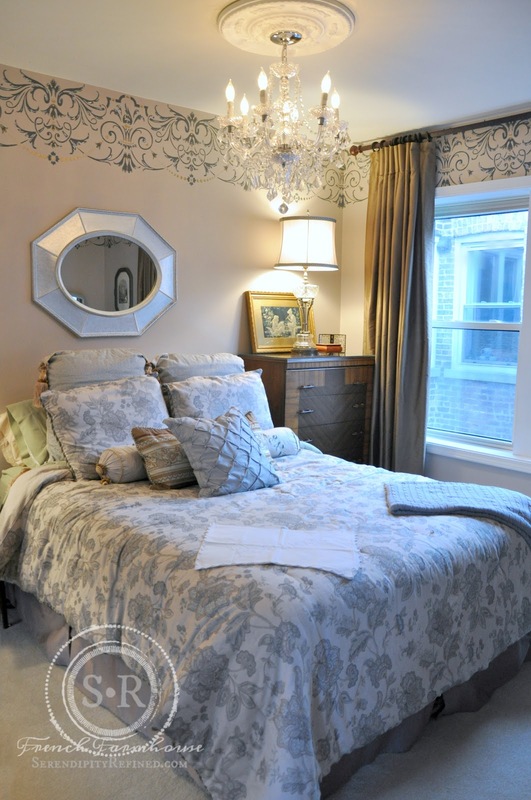 I love the way that the stencil echo's some of the other patterns found in the room. Like those the top of this vintage French built-in which was reclaimed into a shadow box. 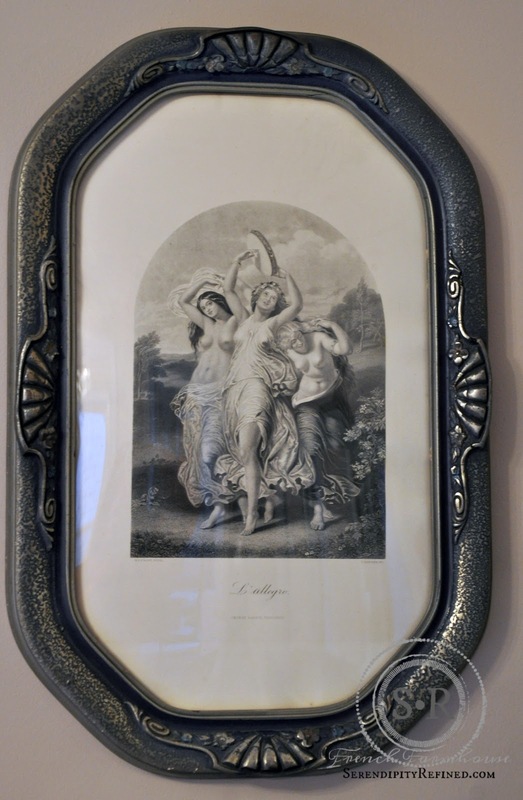 And the design on the edge of the sterling silver frame on this French print. 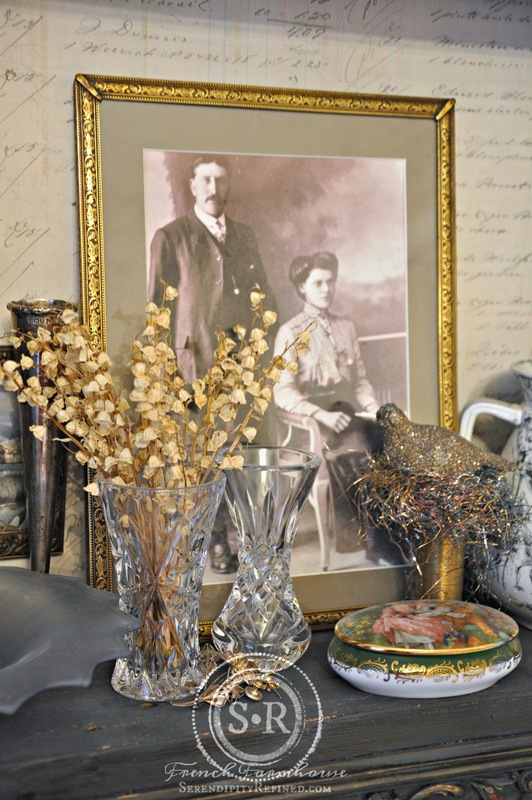 Sadie's room has many art-deco elements as well as a combination of both gold and silver finishes. The neutral wall color has just a hint of rose in it which provided a great background and just the right amount of contrast with the grey. 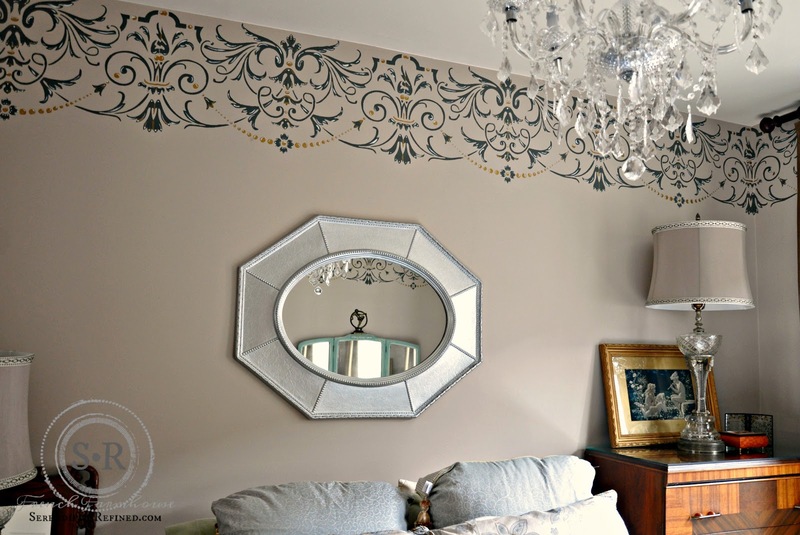 It took me the better part of two days to complete the stencil in this room. Of course, there were breaks....for tea and crumpets (no, I'm not making this up) and to spend time adoring Henry, one of Sadie's two rescued cats. 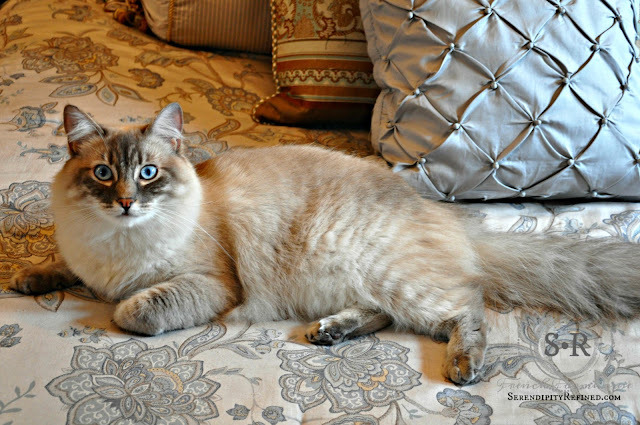 Henry is beautiful....and he matches the color scheme of Sadie's room. Perfect, isn't he?! 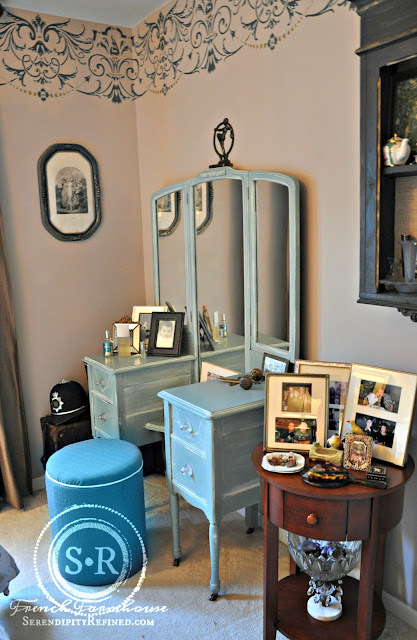 It was also fun to see the vanity table that we made over last year in its new home. 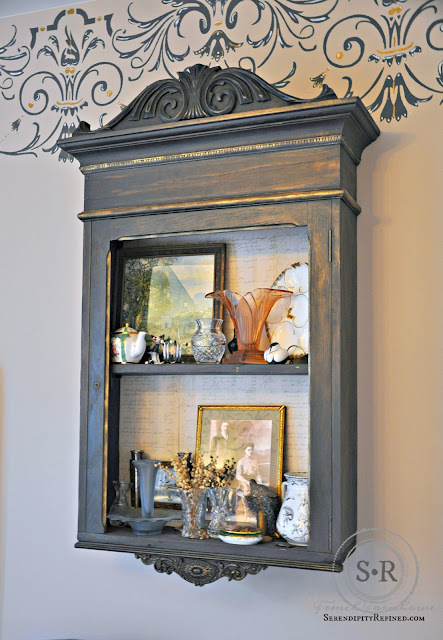 Click the link for details about how we transformed this piece using Annie Sloan Chalk Paint in Duck Egg with white wax. I'm delighted with how Sadie's stenciled bedroom looks now. 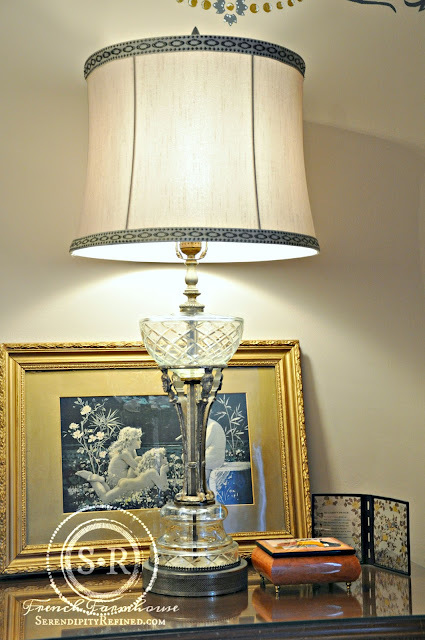 The neutral gray that makes up the main portion of the stencil with gold and white accents helped to unify the elements of the room and made a huge impact for not a lot of money. Stenciling is a simple alternative to wallpaper or crown molding and the colors can be customized to match any decor. P.S. See that gorgeous chandelier?...It's plastic. Yep....it cost just over $100 and came from Home Depot. Who knew? !